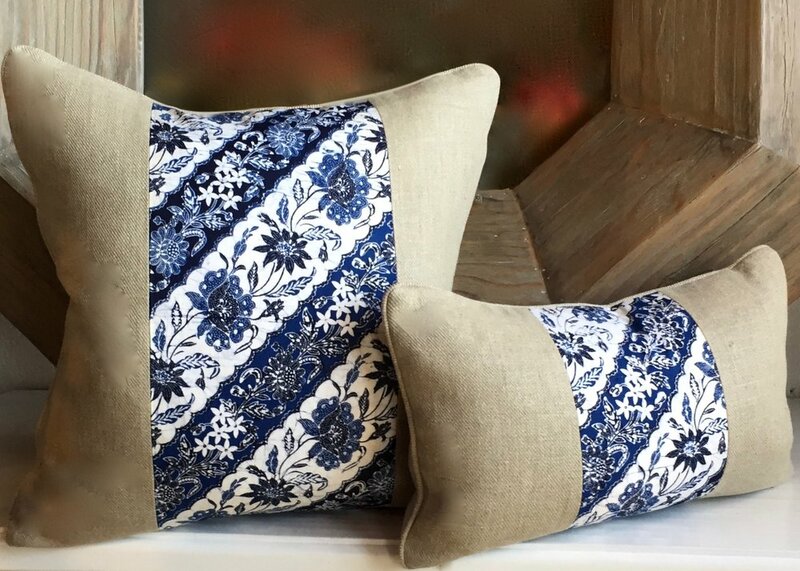 Blue and White Floral Batik - with a splash of Patina across various pillows. We love the age and random splash of Patina. Not every pillow has it - but everyone wants it! Blue and White Floral Batik - with Natural Twill Linen and a Natural Twill Linen Mini Welt. Some of these designs, also carry a random splash of Patina across various pillows. Lumbar Pillow 21" x 13" with a 7" Vertical Batik Stripe - Design of the Batik is on the Diagonal. Square Pillow: 24" x 24" with a 7" Vertical Batik Stripe - Design of the Batik is on the Diagonal.